← Nettie & Friends Craft Show to Benefit Maxfield Learning Center! I promised myself that I would blog on Saturday morning, but I am glad that I waited as my weekend went from good to amazing on Saturday afternoon. On Saturday afternoon I had coffee with some friends on Grand Avenue in St. Paul. On the way to the coffee shop, I realized that a gallery that I had always wanted to visit but had never been open while I was there was, in fact, open. During the visit I had the opportunity to network with an amazingly gifted artist named Marietta and purchased a piece of her work that I had been eyeing through the glass for some time. During that conversation, I learned about a class that she offers that I plan to take and we swapped creative ideas and info. I left the gallery all “geeked up” from talking about art with a fellow artist. After we had coffee we went to the Nettie and Friends arts and crafts sale at the Egg and I in St. Paul. I donated a handful of my pieces to sell in this benefit that raises funds for Nettie’s classroom. (Nettie is a special ed Kindergarten teacher in St. Paul.) When I got there, the place was alive with excitement and filled with happy shoppers choosing their purchases. I am pleased to say that my pieces sold! I am glad to have helped such a worthy cause and plan to have more pieces in the sale next year. I also got a lead on a great place to show my work–so watch for updates as I hope to show there this spring! Then, I was blessed with hours in my studio to work! 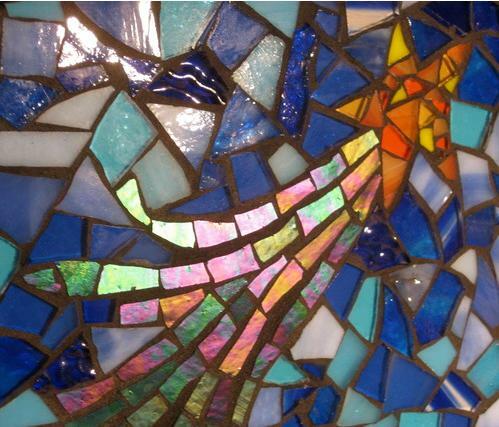 I am excited about the pieces that I have in process or waiting to be grouted. All of this combined with rest and relaxation–what an amazing weekend!